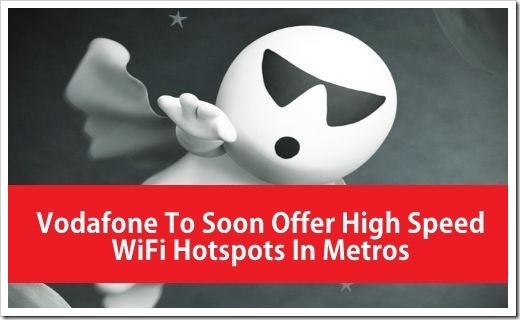 Vodafone India is currently in the process of setting up Hi-speed Wi-Fi hotspots in Metro cities across the country to cater to the high demand of mobile data usage from their smartphone users. According to ET article, Vodafone is testing out WiFi hotspots where the internet usage is quite dense. Vodafone users can access these WiFi hotspots without having to key in the user names and passwords. What Vodafone is essentially trying to do is to decrease the congestion on their network due to high data usage by their users. Once the pilot is complete, Vodafone users who are in the vicinity of these Wi-Fi hotspots can directly connect and start using internet at high speeds. Users will only need to register on the Wi-Fi network when they access it for the first time. From then on, they can seamlessly connect to without having to register or provide any credentials to use. Vodafone is also going one step forward, where users will be automatically switched from their 3G network to Wi-Fi and vice-versa without having to do anything themselves. This facility will be launched at later stage according to Vishant Vora, Director, Technology at Vodafone India. This project is currently under implementation stage, and will go live within next few months. In recent times there have spate of WiFi announcements from various companies, thanks to growing mobile internet consumption across the country. The growth of data has put tremendous pressure on Telco’s existing network infrastructure. WiFi Hotspots like these ensure that they are able to take care of their data needs without user traffic blocking the network. Tata Teleservices had recently announced plans to setup 4000 WiFi Hotspots in 9 cities across India. Reliance Jio and MTNL have both announced plans of setting up WiFi networks in Mumbai and Delhi. Last year, Idea Cellular had soft launched their Wi-Fi services in 5 cities across India including Pune, Ahmedabad, Cochin, Hyderabad, and Vizag. It is not only the Telco’s, but various state governments are also coming up with various WiFi Hotspot initiatives. Recently, Bihar Chief Minister Nitish Kumar unveiled world’s longest stretch of free Wi-Fi zone in Patna. Bangalore had become the first city in India to have free Wi-Fi zones with their implementation of project called “Namma WiFi”. Gujarat Government is also currently in process of setting up Wi-Fi zones across the state in collaboration with Reliance Jio. Indian Elections World’s 2nd Costliest; Politicians Will Spend INR 30,500 Cr!